Josh Griffin insists Hull FC must up their game if they are to follow up on their hard-fought victory over London Broncos this weekend. The Black and Whites were forced to work in order to get back to winning ways in the capital on Sunday, holding off a late fightback to pick up a 28-24 victory over Danny Ward’s spirited Broncos. FC will attempt to build upon the victory this Friday night when high flyers Warrington Wolves travel to the KCOM Stadium, but Griffin, who scored two tries at the Trailfinders Sports Ground, insists the club must make improvements this week. After holding off London with some last ditch defending in the final moments of the game, the centre insists a similarly slack defensive display just won’t do against Warrington, who currently sit second in the Super League. “We knew it would be a tough game coming down here,” Griffin said. “I’m not so happy with the performance but to get the result was great. “A lot of teams will come down here and not take the two points home, but we wasn’t at our best. We conceded some easy tries towards the end of the game. We’ve got some work to do for next week against Warrington. 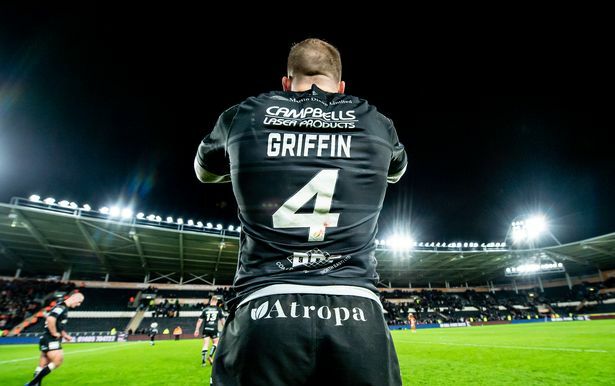 After seeing Jamie Shaul helped off the field with concussion at the start of the season half, Griffin was asked to fill in at full-back for the second time this season, having done so in the victory over Huddersfield Giants at the start of the month. With the Black and Whites having just a five-day turnaround between games Shaul will miss Friday night’s clash against Warrington, but Griffin insists he would be happy to fill in for the England international if needed. “I enjoy it,” Griffin said of the full-back role. “It was obviously a big blow losing Shaul and that’s the second time I’ve done it this season. It gives me a bit more freedom with the ball and have a bit of a rest defensively. My strong point is my carries so when I can have a rest it helps to boost my confidence a bit. "It looks like we might end up losing Shaul because of the five-day turnaround. Radders has got a few options, I don’t think Jake will make it but if I need to step back there I’m happy to do that.